Recommendation for Administrative Monetary Penalty Payment Order for Market Manipulation of 10-year Japanese Government Bond Futures by Citigroup Global Markets Limited. The Securities and Exchange Surveillance Commission today made a recommendation to the Prime Minister and the Commissioner of the Financial Services Agency that an administrative monetary penalty payment order be issued in regard to market manipulation by Citigroup Global Markets Limited (“CGML”) pursuant to Article 20(1) of the Act for Establishment of the Financial Services Agency. This recommendation is based on the findings of an investigation into market manipulation, whereby the following violation of laws and ordinances was identified. CGML is a private limited company that is registered with Financial Conduct Authority and Prudential Regulation Authority in the United Kingdom and does business including securities and commodity contracts dealing, as well as provides trading services to a closely related company. CGML, through its employee who engaged in dealing, in relation to its business, regarding 10-year Japanese Government Bond Futures, December 2018 (“10-year JGB Futures”), which was listed on the Osaka Exchange, Inc. (“Osaka Exchange”), from 7:45 PM on October 26, 2018 to 1:11 AM on October 27, 2018 and 7:16 PM on October 29, 2018 to 1:02 AM on October 30, 2018 as described in the Appendix, with the purpose of inducing Market Transactions of Derivatives of other market participants, without intention to execute, made entrustments of buy orders for 7,603 units and sold 277 units by placing a large amount of buy orders at the best bid price and below, and made entrustments of sell orders for 4,341 units and bought 311 units by placing a large amount of sell orders at the best offer price and above, on the Osaka Exchange, for the account of the closely related company. These transactions constituted a series of Market Transactions of Derivatives and offers that would mislead other investors into believing that Market Transactions of Derivatives were thriving and would cause fluctuations in the market of 10-year JGB Futures. Summaries of the findings regarding the violation of laws and ordinances are described in Attachment 1. The actions mentioned above conducted by CGML were recognized as “a series of Sales and Purchase of Securities, etc.” and “entrustment” conducted “in violation of Article 159(2)(i)” as stipulated under Article 174-2(1) of the Financial Instruments and Exchange Act (“FIEA”). Pursuant to the FIEA, the amount of the administrative monetary penalty applicable to the above violation is 133,370,000 yen. Details of the calculation are presented in Attachment 2. We have investigated this matter based on information provided by the Japan Exchange Regulation (JPX-R). 2. In this case, the total amount of the administrative monetary penalty is 133,370,000 yen. This amount is based on the sum of the amounts calculated as in (1) and (2) below. (1) As for the violation period 1, the administrative monetary penalty is 60,900,000 yen. This amount is based on the sum of the amounts calculated as in (i) and (ii) below. (a) Amount pertaining to the sale, etc. of the securities which were deemed to have been sold on its own account that was owned by its closely related company, pursuant to Article 174-2 (6) of the FIEA and Article 1-17(1)(iii) of the Cabinet Office Ordinance on Administrative Monetary Penalty under the Provisions of Chapter VI-2 of the FIEA, is 400 units, which includes 61 units that were sold, etc. during the acts of violation and 339 units that were sold short on the account held by closely related companies of CGML by the time of the commencement of the acts of violation and are deemed to have been sold at the price of 150.77 yen per unit, which was the price of 10-year JGB Futures at the time of the commencement of the acts of violation, pursuant to Article 174-2 (7) of the FIEA and Article 33-12(i) of the Order for Enforcement of the FIEA. (b) Amount pertaining to the purchase, etc. of the securities which were deemed to have been bought on its own account that was owned by its closely related company, pursuant to Article 174-2 (6) of the FIEA and Article 1-17(1)(iii) of the Cabinet Office Ordinance on Administrative Monetary Penalty under the Provisions of Chapter VI-2 of the FIEA, is 202 units, which includes 60 units that were purchased, etc. during the acts of violation and 142 units that were in its closely related companies’ possession at the time of the commencement of the acts of violation and are deemed to have been purchased at the price of 150.77 yen per unit, which was the price of 10-year JGB Futures at the time of the commencement of the acts of violation, pursuant to Article 174-2 (8) of the FIEA and Article 33-13(i) of the Order for Enforcement of the FIEA. (Note 3): The calculation is as below. (Note 4): 10-year JGB Futures is a future transaction of standardized instruments and its value per unit is calculated by multiplying its nominal price per unit by 1,000,000. (ii) The amount of the administrative monetary penalty regarding the exceeding volume where the amount pertaining to the sales, etc. of the securities exceeds the amount pertaining to the purchase, etc. of the securities as described in (i) above is 60,200,000 yen (Note 5). (2) As for the violation period 2, the administrative monetary penalty is 72,470,000 yen. This amount is based on the sum of the amounts calculated in (i) and (ii) below. (a) Amount pertaining to the sale, etc. of the securities which were deemed to have been sold on its own account that was owned by its closely related company, pursuant to Article 174-2 (6) of the FIEA and Article 1-17(1)(iii) of the Cabinet Office Ordinance on Administrative Monetary Penalty under the Provisions of Chapter VI-2 of the FIEA, is 630 units, which includes 216 units that were sold, etc. 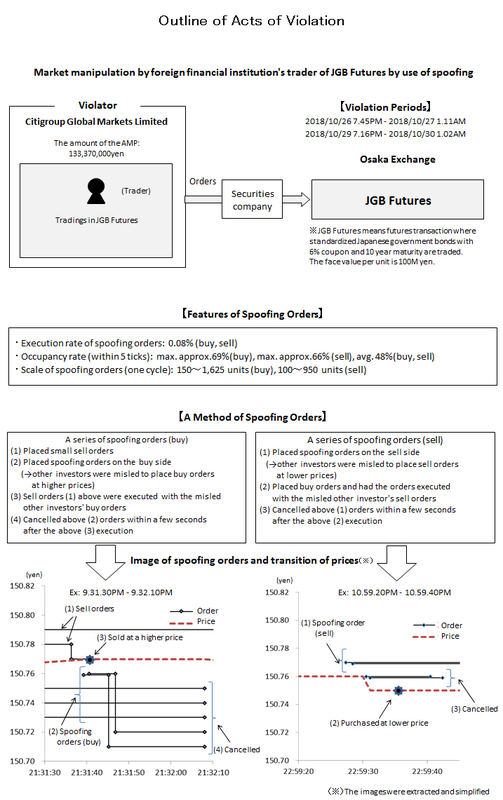 during the acts of violation and 414 units that were sold short on the account held by closely related companies of CGML by the time of the commencement of the acts of violation and are deemed to have been sold at the price of 150.72 yen per unit, which was the price of 10-year JGB Futures at the time of the commencement of the acts of violation, pursuant to Article 174-2 (7) of the FIEA and Article 33-12(i) of the Order for Enforcement of the FIEA. (b) Amount pertaining to the purchase, etc. of the securities which were deemed to have been bought on its own account that was owned by its closely related company, pursuant to Article 174-2 (6) of the FIEA and Article 1-17(1)(iii) of the Cabinet Office Ordinance on Administrative Monetary Penalty under the Provisions of Chapter VI-2 of the FIEA, is 347 units, which includes 251 units that were purchased, etc. during the acts of violation and 142 units that were in its closely related companies’ possession at the time of the commencement of the acts of violation and are deemed to have been purchased at the price of 150.72 yen per unit, which was the price of 10-year JGB Futures at the time of the commencement of the acts of violation, pursuant to Article 174-2 (8) of the FIEA and Article 33-13(i) of the Order for Enforcement of the FIEA. (Note ７): The calculation is as below. (ii) The amount of the administrative monetary penalty regarding the exceeding volume where the amount pertaining to the sales, etc. of the securities exceeds the amount pertaining to the purchase, etc. of the securities as described in (i) above is 69,170,000 yen (Note 8).